Collecting grass clippings at smaller turf farms. 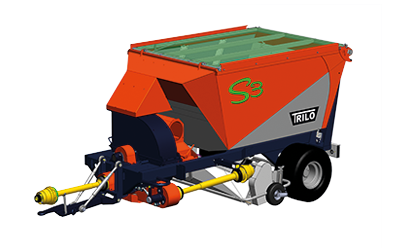 Compact and maneuverable vacuum sweepers with a bin capacity of 3 m3 suitable for smaller turf farms with an area of approximately 10 hectares. With compact vacuum sweepers you will be able to sweep and collect grass clippings and leaves. A powerful fan provides great suction power and is mounted inside housing fitted with a replaceable lining. The fan is driven by a PTO drive shaft attached to the tractor and requires an output of The required hp PTO can vary depending on the working conditions.35 – 60 HP (26 – 44 kW). Because of the shaft in the suction hood being exchangeable, compact vacuum sweepers can be configured for several tasks. Optionally, the vacuum sweepers can be fitted with a wander hose to vacuum materials from hard to reach places. • Medium-sized tyres for low ground pressure. • Optional wander hose (6 m).